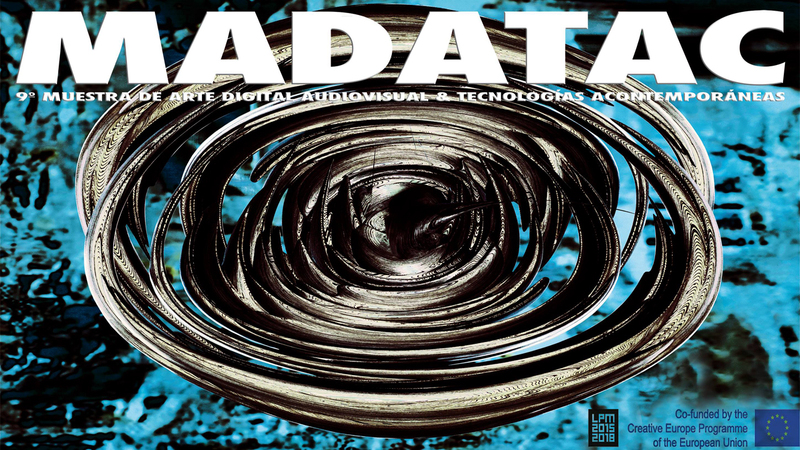 MADATAC is the International Exhibition of Audiovisual Digital Art and Acontemporary Technologies that reaches its ninth edition having established itself in Spain as the benchmark of digital culture and of the most experimental art. From 10 to 20 January, Madrid will become a hotbed of Video Art and New Media Art in various venues in the city, one of which, the Conde Duque Cultural Center, will gather from the 16th to the 20th the work of more than one hundreds of video artists from 50 countries that will show the most avant-garde, original and poetic that is currently being done in the field of new audiovisual art in the world. All this through exhibitions, screenings, conferences, performances, installations, workshops and audiovisual concerts of great figures from the world of the new electronic art. This edition, entitled “Interactive / Outeractive” presents an interactive approach to the possibilities of the new audiovisual art through the visualization of video creations and installations where virtual reality is presented as a possible way to reinvent the digital arts and explore the spatiality that surrounds us in the form of artistic experiences, aimed at transforming and redeeming our consciousness about the limits of our own reality. From an interdisciplinary perspective, and merging the world of technology with that of the imagination, MADATAC challenges conventional cinematic narratives by offering the most transformative audiovisual art in a bid for risk and beauty. For the show, personalities such as Roy Ascott, Roman Gubern, Lech Majewski, Reynold Reynolds, Claudia Gianetti, Bernd Lintermann, Wu Tien-Chang and Brian Eno, among many others, have been involved, and figures like Bill Viola are linked to it, as has Abbas Kiarostami. MADATAC disseminates the art of New Media and the most unpublished, unclassifiable and visionary video art, the one that promotes the art of seeing the unseen. MADATAC has been internationally recognized twice with the EFFE distinction in the biennium 2015-2016 and 2017-2018, by a jury from Brussels that has highlighted the artistic quality of the festival and its significant impact at local, national and international level. The Official International Competitive Section of MADATAC 09 will be composed of works by 54 artists from around the world, selected from a set of more than 400 pieces presented of experimental video art, which can be viewed on the big screen in the Assembly Hall of the CC Conde Duque (Tuesday 16 from 19 to 21.30 and Wednesday 17 from 18 to 21.30). Distributed in 5 programs of approximately one hour, the viewer will find works that cover a multitude of themes through amazing audio-visual languages. Immersive works where the sensory world is investigated as a form of reflection on the present and the future of humanity; the problem of migration; models of identity and freedom of choice in a society governed by social and consumer conventions; the feminine identity or the criticism of the gold that always underlies all religion: subjects that coexist with videos that show all those conditions that prevent us from pursuing our dreams and that lead us to loneliness. Water, books, language, beauty, earth, sea, love, warmth, man, woman, desire, shadows and reflections of our changing perceptions, psychedelic and aesthetic daydreams that question the relationships between art, science, philosophy and questions fundamentals about human existence. Visual metaphors that adhere to the search for a new role for the human being within the universe and the need to immerse ourselves in Nature as one more. Dichotomies, dystopias, utopias … Who we are and where we come from: the secret kept in the abyss. A journey towards the possibilities of the unknown or to the known that we apparently do not see.